Kenda Big Job is a one step polishing system.This fast working polisher is designed for large job multi restorations. Ideal for fine surface polishing of all composite restorations. Disposable polishers saves sterilization cost and time.These polishers are indicated for all composite and compomer restorations as a pre-polisher for smoothing and a final polisher for fine surfaces and a high long lasting shine. Consists of silicon rubber and diamond powder made of medical plastic. 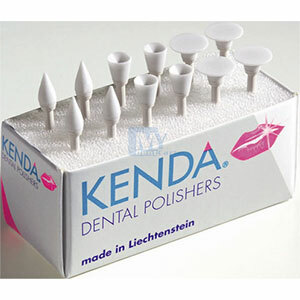 Disposable polisher saves sterilization cost and time.